Renew your acquaintance with Scotland's national hero and Hollywood legend, Sir William Wallace at the spectacular 220 foot high National Wallace Monument, completed in 1869. Learn all about the turbulent events leading up to the Battle of Stirling Bridge and become one of the observers at Wallace's trial in London as you step into a re-creation of Westminster Hall. Listen to the unique talking head of Sir William telling his own story and speaking with other key figures from the Wars of independence - including Robert the Bruce. 'Building The Monument' is an exhibition gallery where an amazing story is told - of how Victorian energy and vision led to the completion of this incredible structure in the 1860s. You can also see the Wallaces mighty two-handed broadsword. It is easy to imagine the force of it during battle! It has resided at the National Wallace Monument since 1888. Don't miss a visit to the Hall of Heroes where you can hear the stories of other famous Scots - past or present. A climb to the top of the monument gives you magnificent views of the surrounding countryside and a feeling of total 'freedom' as you learn about its history. 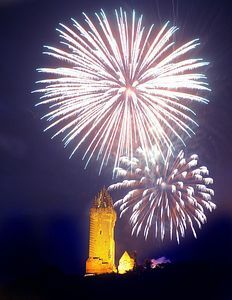 The National Wallace Monument is located just outside Stirling - and is signposted from the city centre and from the A91.